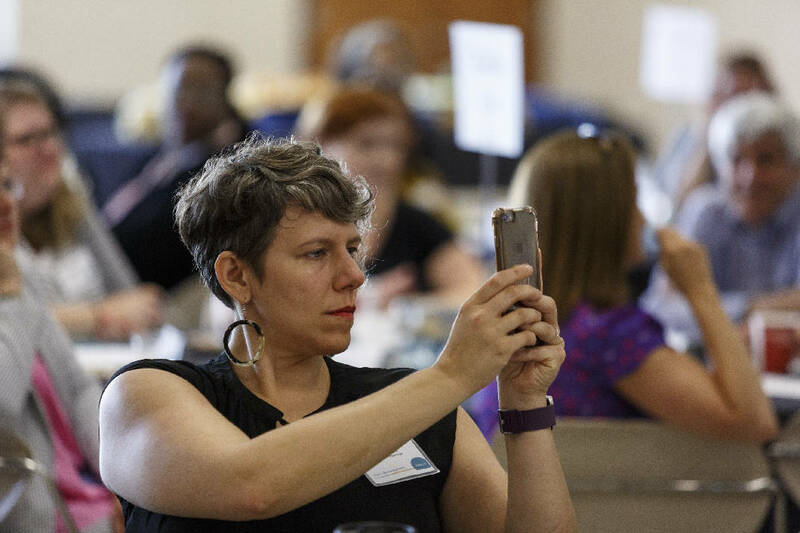 Ariel Ford takes a picture with her phone during an update on the Chattanooga 2.0 initiative on the campus of the University of Tennessee at Chattanooga on Thursday, July 13, 2017, in Chattanooga. Next week, a UnifiEd team will begin analyzing community input as it works to address inequities within Hamilton County's public schools. 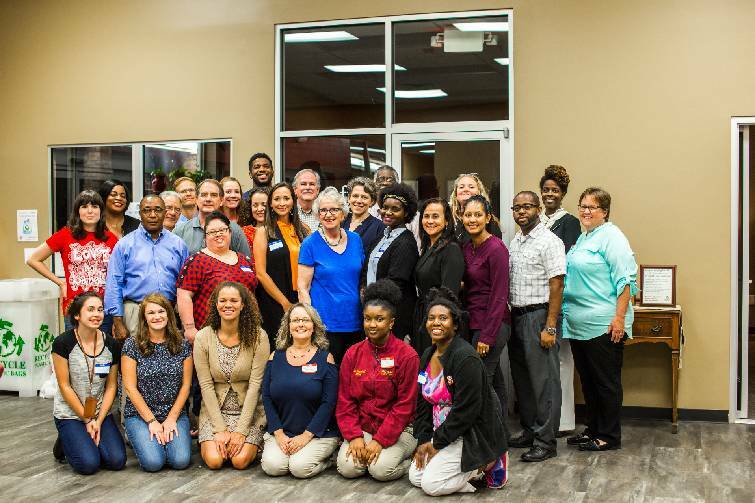 The local education advocacy organization's Action Plan for Educational Excellence, or APEX, project was launched Aug. 1 with the goal of gathering community feedback from around the county. Once opinions are gathered, the data will be analyzed in order to draft a policy platform that the public will vote on before UnifiEd presents it to local officials. To gather public input, UnifiEd has been hosting a series of small group discussions called EdTalks during which facilitators collect surveys from attendees. Once the project's steering committee was established, those members held their own set of EdTalks in their neighborhoods. And not long after the initial August launch, an online version of the survey was established. "The survey is an even deeper dive into the community," Ariel Ford, steering committee member, said. "[It's] a way that we're trying to get even more input from as many people as we can across the county to learn what's important to our community." A two-minute educational video is featured on the website and gives an overview of the APEX project, as well as instructions on completing the survey. The survey asks respondents to name three equity issues that need to be addressed, as well as possible solutions to those inequities. Reginald Gilmore, another steering committee member, said the research gained through the EdTalks and the survey will help create policies that will provide "the same resources throughout Hamilton County instead of it only being available in certain schools." The EdTalks will wrap up on Monday, and the online survey, found at www.unifi- ed.org/apex, will close that day at midnight. UnifiEd's team will analyze the responses for the following two weeks and enlist the help of the steering committee to create a policy platform, which will be a collection of policies that would be adopted at varying levels of county government, school board, school system or individual schools. Once those policies are drafted, UnifiEd's second phase involves taking a small school bus to several high-traffic locations around the county, such as grocery stores, malls or community centers. The bus will be fitted on the inside with an interactive exhibit showing the collection of preliminary policy proposals. Between December and January, people will be invited to board the bus, talk to organizers, review the preliminary policies and vote on the ones that fit their priorities. The outcome of those results will be the policies that are included in the final policy platform to be released and presented to local officials in February. UnifiEd will continue to work with the school board, county commission and school district administrators to adopt the policy changes by the end of 2018. "The goal of the APEX project is not just to create an action plan by elevating community voice, but also to fight to see that plan's policies adopted and fully implemented by the county and school system," Jonas Barriere, executive director of UnifiEd, said in an email. "And following the policy platform's release in early 2018, that's what we intend to do." He said he is not concerned that the policies may go by the wayside once they've been brought to the school board or other county officials. "We are already working to ensure our elected officials understand the work we are undertaking, and what role they play in the action plan," Barriere said. Ford also said she doesn't think it will become a policy "that sits in a drawer." "All of us have a responsibility for equity," she said. "This does not fall on the shoulders of the school district alone. So, while it could become one of those policies, the power is really in the fact that we have so many voices contributing to this effort and we each have a responsibility to carry it through."